My family's in Tokyo for a year so effectively using this new thing called "free time", I've been listening to a lot of retro game tune classics. One song that I've never covered is Sutakora Sassa, or the end credit roll song. I played lots of Golden Axe on the Genesis back then, and this tune stuck in my head, though the dominant song was "wilderness" that you hear in the first level. Sutakora Sassa is innately pop, with a simple chord progression and the melody that assertively communicates the pop vibe. I decided to take the tune for a spin to see what I could do with it. It's a short loop, so I gave it several interpretations, added in some new bits to thin out the otherwise very dense song structure. I'm particularly fond of the screaming lead which is stylistically more close to the Gradius series sound rather than anything Genesis. It's nice to have a very confident lead. It's like a champion! Mainly added chord stabs and such to sell the chord progression more, and also added in 2nd and 3rd voices to the melody here and there to make rad harmonies Nintendo style. I also threw in bits and pieces of "wilderness" and the title screen theme as "toppings" without going all out and turning it into a medley. 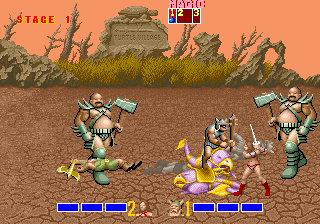 Sutakora Sassa is stylistically too different from the rest of Golden Axe themes that a medley would be difficult to make mesh well. I'm at a point where I'm looking for other ways to cook up this thing, feedback or suggestions welcome! But man, while I enjoy listening to this uplifting, happy and fun vibe, it takes a lot of energy to stay in that headspace for hours.. I might need to recharge for a bit. custom synthedit fx on drums, Reaper's eq and comp most everywhere, and tons of Cyanide. Bionic delay for LCR style delay on leads. Trueverb for overall send verb. Reaper comp, preamped, L1 on master. what? Only zip files now?